Grilled Flatbreads, Garlic Oil and a Brunch Idea. 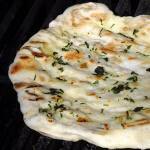 How to make homemade garlic oil and then use it on homemade flatbreads made right on the backyard grill. Today I thought I’d share a recipe for grilled flatbreads which are always very popular at our house during the summer grilling season. We really enjoy crispy, chewy, warm flatbreads straight off the backyard grill. These are great just cut in wedges and served beside your favourite summer salad or soup but we use these flatbreads in many other ways as well. We’ve used them as a base for a salad, as part of great grilled chicken salad wraps, or as the base for great pizza cooked on the grill. As pictured above, brushed with garlic olive oil and sprinkled with herbs from the garden, they make great hors d’oeuvres topped with some roasted tomato jam and freshly grated parmesan or Romano cheese. I often make this dough a day in advance, especially if using it for breakfast and store it overnight in a sealed container in the fridge. I find the flavour of the flatbreads improves with this method. I’ve included instructions for making your own garlic olive oil as well because I find many commercially available garlic oils just don’t have enough flavour for me. By making my own I can have it just how I like it. See a great brunch idea using flatbreads at the end of this post too. For Dozens of other terrific ideas for the backyard grill or BBQ check out our entire category of BBQ & Grilling Recipes. 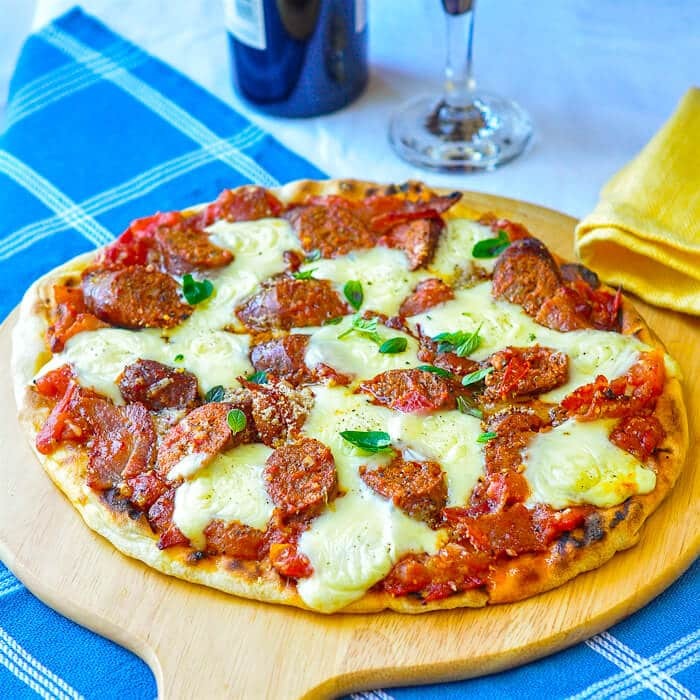 If you liked this recipe, You can find out more about How to Make the Perfect Grilled Pizza too. Grilled Flatbreads, Garlic Oil and a Brunch Idea - how to make homemade garlic oil and then use it on homemade flatbreads made right on the backyard grill. Makes sufficient for 6 - 8 flatbreads. Place all ingredients in the bowl of a stand mixer equipped with a dough hook. Mix for 5 -10 minutes on medium speed. You may need to add a little more flour, a tablespoon at a time until the dough doesn't stick to the sides of the bowl. Alternatively stir together with a wooden spoon before turning out onto a floured bread board and kneading for 5-10 minutes. Cover the dough and allow to rise for about an hour until about doubled in size. Turn the dough onto a floured surface and knead for another few minutes. Divide into 6-8 equal portions, form into balls and let rest for about 10-15 minutes before stretching or rolling the dough out into about 9 inch rounds. Preheat your gas grill to about medium low heat and place the stretched dough portions a couple at a time directly on the grill. Watch these carefully, adjust the temperature and move them around on the grill as needed. At this point you can brush them with garlic olive oil and sprinkle with chopped herbs if you like before flipping the flatbreads and grilling the flatbreads for about another minute. Over minimum heat heat the olive oil and sliced garlic slowly for about 15 - 20 minutes or just until the garlic slices begin to bubble at the edges. 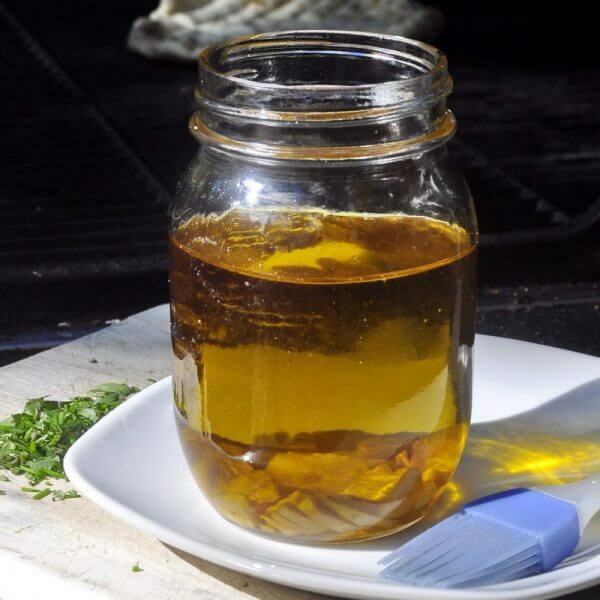 remove from the heat and allow to cool before storing in an airtight container or in mason jars. While the oil is still warm, you can add fresh herbs to the oil for extra flavour. Rosemary and oregano work well, just be sure to crush the leaves a little before adding them to the oil to impart more flavour to the oil. 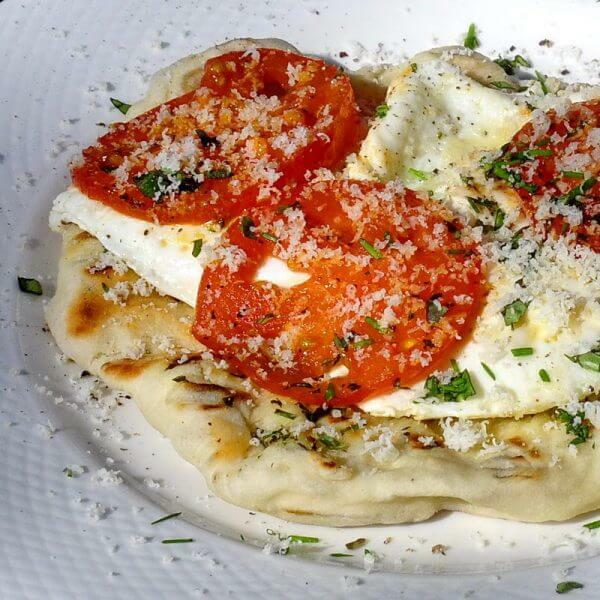 And finally, one more of my favorite ideas for great grilled flatbreads is as a base for a great brunch. Here, I've used garlic and herb flatbread beneath 2 eggs over easy, fried tomatoes and a sprinkle of fresh black pepper and freshly grated parmesan cheese. Crumbled bacon or breakfast sausage can obviously be added as well. Beautiful flatbreads and such a lovely idea to pair them with homemade garlic oil. how long do the garlic oil last for it goes bad? It should store well in the fridge for at least 2 or 3 weeks, Artise. Thanks Barry for another fabulous recipe. At what point do you chill the dough if using the next day? At which step could you refrigerate this dough to use a few days later. Do you let it go through the rise before or after refrigeration? I freeze dough generally immediately after the first rise. is there another way i can cook them instead of a grill? an uncoiled cast iron pan will do the trick on about medium heat. WHAT ARE THE AMOUNTS FOR THE GARLIC OLIVE OIL RECIPE? It really depends on how garlicky you like it. I would use a whole head of garlic in a cup of oil but I LOVE garlic! Anywhere from 3-4 cloves up in a cup of olive oil will be good. Could I use minced garlic from a jar to make the garlic oil? Thank you! I don’t because it is often preserved with vinegar and other things. Fresh is best. Just wondering if traditional yeast can be used and if so I would assume that instead of mixing all together you would proof your yeast before mixing with flour ? I have tried many of your recipes and so far they are all amazing so thank you for sharing ! Traditional yeast does require proofing.